Earlier this week, I had mentioned how I wanted to force a card I loved in standard. 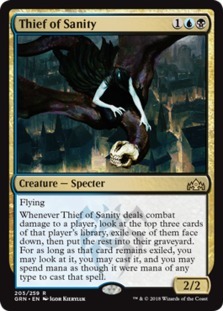 To many people, they would naturally assume Teferi, Hero of Dominaria is my favorite card in standard but it's actually Thief of Sanity! I decided with the deep card pool we have, I had to think about where a card like Thief of Sanity could fit and that was when I realized why not try Sultai Midrange? We already have tons of cards like Thoughtseize and Inquisition of Kozilek to clear the way of problematic removal spells. On top of that, we have other threats like Tarmogoyf, Scavenging Ooze, and Tireless Tracker as other threats people will eventually need to deal with. We can then deploy a thief after we've exhausted people out of answers. Not only would our hand disruption be strong, but we can also follow them up with cards like Liliana of the Veil, Jace, the Mind Sculptor, and Liliana, the Last Hope! 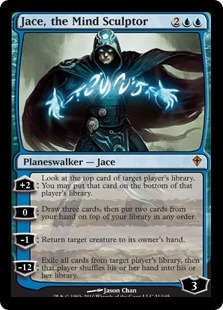 Lily of the Veil will continue to keep them out of cards while Thief + Jace pile up more cards. Last Hope is a way for us to keep the path clear and the -2 is a way for us to bring back a thief! Amulet Titan 2-1 (W): This match up is nasty game one so we were fortunate enough to steal game 1! Esper Gift 1-2 (L): This was a very close match up. Azorius Control 2-0 (W): Our opponent wasn't the happiest person losing to us assembling super friends when we got their Teferi, Hero of Dominaria, and Jace, the Mind Sculptor. Guess I really can't get away from playing Teferi, eh? Sultai Reclamation 1-2(L): This can't be a good matchup for us. The only game we were able to win was with Thief of Sanity running away with the game. It also didn't help that I had a misclick hahah. I'm definitely going to be revisiting this gameplan after #MTGLondon. All I can say moving forward is that this list was definitely not optimal. I'd love to move things around in the sideboard. Maybe another copy of Negate and a fourth copy of Assassin's Trophy. Surprisingly, I didn't run into a single Dredge or Arclight Phoenix deck but that doesn't mean we shouldn't respect those decks. As you can tell we're still ready to play that matchup as Kalitas, Traitor of Ghet is an absurd card in any black based midrange deck. I still liked having Nihil Spellbomb in the main as they can just cycle themselves out if they're irrelevant in a match. It's also sweet to trigger revolt for Fatal Push with it. Maybe this is a reach but I kind of want to try Find // Finality to see how many standard cards I can get away with but most likely I'll be adding a few Eternal Witness to this list. Oh and I'll definitely look to add more dexterity as some misclicks were really painful.